When Apple’s iPod first hit the scene back in 2001, it represented a sea change in the way we listen to our music. It definitely wasn’t the first portable MP3 player, but it did take some pretty massive strides right past everything else on the market. The iPod quickly replaced the Walkman in the zeitgeist of portable music. It didn’t take long for people to start asking, “how do I listen to this iPod thing in my car?” And back in 2001, the answer was pretty simple: buy a cassette adapter, an FM transmitter, or an FM modulator. The iPod car connector situation is a little more complicated today. Cassette tape adapters are designed for older head units that have cassette decks but no built-in auxiliary inputs. The sound quality of a cassette tape adapter will depend on the condition of the tape deck, the build quality of the adapter itself, and other factors, but they aren’t prone to outside interference. You use this type of adapter by inserting the unit into your tape deck and then plugging it into your iPod’s headphone jack. FM transmitters can be used to connect any type of iPod, iPhone, and really any other type of MP3 player, to any head unit that has an FM radio. That means these adapters are useful if your head unit doesn’t have a tape deck or an auxiliary input. A physical wire connects the FM transmitter to the headphone jack in your iPod, and then the device transmits your music to your head unit via the FM band. FM modulators are similar to FM transmitters, but they are designed to be hard-wired in between your head unit and car antenna. Instead of transmitting via the FM band, a signal modulated with the output from your iPod is inserted via the hard-wired connection. That makes FM modulators less prone to interference than transmitters, although they are more difficult to install. Auxiliary inputs are included with some head units, and they can be used to connect an iPod. Most auxiliary inputs take the form of a jack that you can connect directly to the headphone jack on your iPod. In addition to the basic methods that can be used to connect any MP3 player to a car stereo, there are also a number of iPod-only connections. Although these advanced connection methods give access to advanced features, they’re only available from specific head units. USB iPod connections are by far the easiest to deal with. When a car stereo is iPod compatible and includes a USB port, you can typically use any dock connector or lighting cable that has a standard USB connector at the other end. Using this type of connection works just like connecting your iPod to your computer, only you’re plugging it into your car stereo instead. Although this is typically a very easy way to connect an iPod to a car stereo, the difference between USB and using an auxiliary input can be remarkable. iPod adapter cables are necessary in other situations. Although a lot of iPod compatible car stereos come with USB ports, others require a proprietary adapter cable if you want to take advantage of all the available features, like direct iPod control. For instance, the correct iPod adapter cable may allow you to control Pandora and other iPod music apps directly from your head unit. These adapters sometimes use a totally proprietary connector, while others have a USB connector in addition to other connectors. External iPod control boxes are typically optional equipment for factory stereos. So if you have a relatively new vehicle, and you’re happy with the radio, you may want to check to see if an external control box is available for your iPod. These control boxes are wired into the OEM stereo with a proprietary connector and then provide you with a USB connection for your iPod. In many cases, you will then be able to operate your iPod via the factory head unit’s controls. Although there’s nothing inherently wrong with using a cassette adapter or an auxiliary input to connect an iPod to your car stereo, there are some advantages to using a digital connection. The main benefit is sound quality. When you hook an iPod up to a car stereo via the dock or lightning connector, instead of the headphone jack, the heavy lifting gets passed from the iPod to the head unit. Digital information is passed via the connection, and the head unit, which is much better equipped for the task, actually decodes and processes it. The other benefits of using an advanced connection are mainly related to ease of use. Instead of changing songs and performing other functions with the iPod controls, you are typically able to do so with the head unit controls, which are designed to be more safely operated while on the road. If you aren’t in the market for a new car stereo, then you’re limited to the connections that your current head unit supports and the associated features. If you are looking for a new head unit, on the other hand, there are some additional factors you may wish to consider. For instance, the display and controls vary widely from one head unit to another, and the fact that a head unit has an iPod connector doesn’t necessarily mean that it will support all the features you’re looking for. 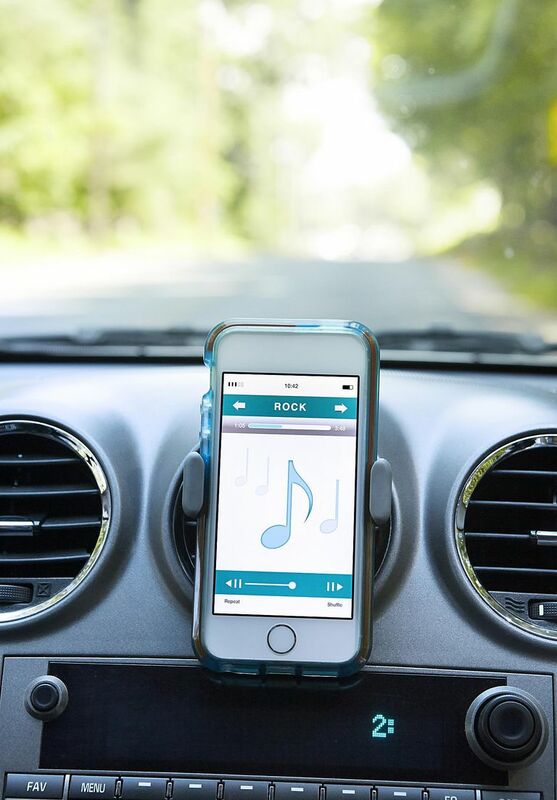 One huge benefit of using a digital connection between your iPod and car stereo is that it can allow the stereo to display information from the iPod. With that in mind, you’ll want to pay special attention to the type of display that each unit includes when looking at new head units. Some single-DIN head units, particularly budget-priced models, feature single line displays that are only capable of showing a very limited number of characters at a time. At the opposite end of the spectrum, double DIN head units with touchscreen displays can display a huge amount of information about the song you’re listening to, and provide touchscreen controls besides. In either case, you’ll want to look for a head unit that makes it simply read the display at a glance. Another benefit of using a digital connection is that it can allow you to control your iPod directly from the head unit. This can be a huge convenience, or an even bigger headache, depending on the head unit in question. Some head units that only include basic controls require you to push extra buttons or enter additional menus to control the iPod, which can be difficult— or even dangerous — while you’re driving. Others have specific iPod controls, and some even utilize control schemes that are very similar to the iconic iPod “click wheel” that you’re probably already pretty used to using without looking at it. Aside from those two basic concerns, you’ll also want to verify that any new head unit you’re looking at supports the specific feature set that you’re interested in. Some head units offer basic audio playback, while others support video playback, direct app control, and even Siri integration. Never take it for granted that any given head unit will include any or all of those features, or you’re bound to end up disappointed.